Information about scheduling, cancelling classes, changing classrooms, teacher candidate course/section changes, missed classes, expenses, strike or job action events, medical emergencies/first aid, and crisis intervention (which is provided by the TEO personnel) and are detailed in this document. We are here to support you! Visit Our People to find an up-to-date list of Faculty and Staff at the Teacher Education Office. In general, questions about course details should be directed to the appropriate department personnel via the course coordinator. For example, an EDCP course inquiry should be directed to the Department of Curriculum & Pedagogy while an EDUC course inquiry should be directed to the TEO. The Faculty of Education website is an excellent resource for learning about all the various departments, institutes, and service centres. Bachelor of Education teacher candidates are enrolled in many courses during their 11- month program. To ensure that they have adequate time to complete all assignments, instructors are asked to coordinate the deadlines for assignment submission. Where possible, attention should also be given to an appropriate course workload across the program. Elementary cohorts hold instructional meetings in the fall to discuss this, and the TEO meets with elementary and secondary course coordinators. Instructors are required to provide teacher candidates with course outlines that contain written expectations, (e.g., assignments, attendance, missed classes, academic integrity, professional conduct), at the beginning of each course. The date and session of each course needs to be included. Please include elements of the revised teacher education program where possible, such as inquiry, social justice and diversity, language and culture, respect and inclusion, and Indigenous perspectives. We encourage you to copy and paste the suggested working of these teacher education policies onto your course outlines. Departments may have their own guidelines. The integrity of academic work depends on the honesty of all those who work in this environment and the observance of accepted conventions concerning such practices as acknowledging the work of others. Plagiarism and other forms of academic misconduct are taken very seriously at UBC, whether committed by faculty, staff or students. You should be aware of the sections of the University Calendar that address academic misconductand of the university’s website on scholarly integrity. The Teacher Education Office posts its guidelines on Academic Integrity and Plagiarism and the UBC library also has a useful webpage on academic integrity and plagiarism (and tips for avoiding plagiarism). If you have questions or concerns about any of these policies or conventions in relation to how they apply to the work you do in this course, please discuss them with me. Attendance and participation are essential to the experiential learning that is necessary within a professional program. Participation in class activities and discussions form the basis of professional inquiry and development. Teacher candidates are expected to attend all scheduled classes, lectures and seminars. Teacher candidates who miss a significant amount of class time may be required to repeat the course. If you are going to be absent, please inform me by email, by phone, or in writing. See UBC BEd Policies and Guidelines > Expectations > Attendance and Participation for more details. Most courses in the Teacher Education Program use a pass/fail grading system. For this course, only “pass” or “fail” will appear on your transcript. In a professional faculty, passing a course entails both good academic performance as well as active participation in learning activities. Students are expected to meet all criteria to receive a passing mark. If assignments do not meet expected standards, you will have one opportunity to revise and resubmit assignments. In such cases, please attach the first version of the assignment and that you highlight the changes you have made in response to my comments. If you have continued difficulty meeting expectations, I will discuss your situation with you and also with the Teacher Education Office. It is my responsibility to provide you with timely, specific and helpful responses to your assignments. Teacher candidates in the Faculty of Education are expected to adhere to principles of professional conduct while on campus and in schools. See UBC BEd Policies and Guidelines > Professional Conduct for more details. Teacher candidates are expected to adhere to the UBC policy on respectful environment. Participants in this course are expected to demonstrate all the qualities of professionalism, arriving at each class fully prepared, engaging actively in the teaching and learning process, and interacting ethically with peers and the instructor. Classes will be conducted in an atmosphere of respect for each other and for the ideas expressed. My responsibility in this class is to model professional conduct and to guide you to an understanding of professionalism when you are on campus and in the field. If you have a letter from the office of Access and Diversity indicating that you have a disability that requires specific accommodation, please present the letter to me so that we can discuss possible accommodation. To request academic accommodation due to a disability, first meet with an advisor in the Office of Access and Diversity to determineyoureligibleaccommodations/services. Please keep the Teacher Education Office informed about requests for accommodation. For anticipated absences, teacher candidates must meet with a Program Coordinator and/or notify the Teacher Education Office in writing at least two weeks in advance. The Faculty of Education each year nominates BEd teacher candidates for scholarships and awards with a total value in excess of $90,000. Some awards are targeted towards specific subjects, but the majority of awards are applicable to all BEd teacher candidates who demonstrate outstanding work. All Instructors and Faculty Advisors have the opportunity to nominate teacher candidates for these scholarships and awards. Additionally, students have the opportunity to nominate themselves. Visit the Awards page for a list of awards and more information about the application process, nomination deadlines, and nomination forms. Nominations are received and collected by the TEO, and teacher candidates are awarded based on the number of nominations received. It is essential that instructors participate in this process by submitting nominations. Where BEd teacher candidates participate in multi-section courses, it may be helpful for instructors involved to develop common criteria. This is an issue to be discussed with the Course Coordinator or Deputy Head. Questions about the nomination process or requests for nomination forms can be directed to Lorrie Miller in the TEO. Nominations for NITEP (Indigenous Teacher Education Program) teacher candidates are coordinated by the NITEP program. Please refer to “Program Coordination” > Course Outlines > Pass/Fail Grading. Instructors who are concerned about a teacher candidate’s progress during a course or a practicum are expected to inform the teacher candidate of the concern as early as possible. In order to ensure due process for a teacher candidate, as soon as the concern is observed, the instructor should write an Interim Report (available from TEO program or practicum coordinators) outlining the concern, ways to address the concern and the timeline for addressing the concern. The teacher candidate must receive a copy of the report and be provided with an opportunity to discuss it. Be sure to find a private office or other space for such meetings. The staff at the TEO front desk can book the TEO meeting room for this purpose. TEO Program Coordinators and the Director of Teacher Education are available to discuss the format and the content of Interim Reports with instructors and to participate in follow up meetings with the teacher candidates and instructors as required. Note that the earlier in the term the interim report is written, the more time is available for concerns to be addressed adequately. A copy of this report is also given to the TEO and placed in the student file. See UBC BEd Policies and Guidelines > Advancement in Coursework. Instructors enter marks directly online or follow departmental guidelines for entering grades. In some departments, instructors are asked to enter and save grades rather than ever and submit, so it is important to check with the department offering your course. They are also advised to keep a copy of all grades in case of error or omission. Students must first be given the opportunity to complete their online course instructor evaluations, and instructors may then submit standings or grades as soon as possible (See Section VI.4). Delays inputting the standings in the Teacher Education Program affect teacher candidates’ ability to proceed to practicum, to receive scholarships and awards, to be approved to graduate, and to be recommended to the B.C. College of Teachers for teacher certification. Completed records of grades are also important for teacher candidates who are applying for teaching positions. If a teacher candidate is failing a course, please notify the TEO as early as possible. Advancement to practicum depends upon successful completion of all coursework taken before the practicum. Grades for practica are entered by TEO Practicum Coordinators. Please ensure that all other teacher candidate grades are recorded in Faculty Services Centre (FSC) within 7 days from the date of the last class. The Faculty Service Centre (FSC) website provides information for instructors to obtain class lists, student photos, email teacher candidates and enter grades. To enter grades and print class lists, an instructor must first apply online. Once access has been obtained, instructors can log on to FSC. All teacher candidates take a course in Assessment and Learning prior to their extended practicum. Methodology and other courses should also address and incorporate assessment topics in coursework. Teacher candidates have requested group assignments be assigned at term start as they find such assignments challenging to complete during their busy term-end.Cohort coordinators at the elementary level can facilitate discussions about assignment timing and coordination among instructors. Integration of topics – Teacher candidates can benefit (both individually and in group work) from addressing the same topic in different classes while integrating different thematic emphases. For example, sample units on ancient civilizations can incorporate language arts, social studies, math, etc., and teacher candidates can, therefore, engage in integrated learning pedagogies. Fewer reflections – Take into consideration the number of out-of-class reflections required per course. Please note that, teacher candidates benefit from an initial explanation of what is meant by a reflection, i.e., the critical analysis of a reading, lecture or experience. The Teacher Education Office assists instructors in the application and implementation of UBC policies. Others are referred the section, Course Outlines. The complete version of the UBC BEd Policies and Guidelines available on the Teacher Education website. We recommend you share this e-publication with your students. Teacher candidates may request concessions from their instructors where illness, injury or unusual circumstances warrant. In each case, if a request for a concession is granted, the instructor and teacher candidate will agree (in writing) on a specific date for completion of the outstanding work and any conditions that apply. This date must be set prior to the next full term. Please consult a TEO Program Coordinator whenever concessions are requested or when there are any other unusual circumstances affecting grades. A Standing Deferred (SD) grade must be approved by the TEO or the Head of the Department concerned. Please consult with a TEO Program Coordinator for more information about the steps involved. A cohort may establish its own website or blog. Personal student information, including names, phone numbers and email addresses, should not be posted on the site without the written permission of each teacher candidate. Please retain the written permission forms as part of course records. The video-record/file is erased when its purpose has been fulfilled. It is Faculty of Education policy that every course with five or more teacher candidates be evaluated using an online system. Evaluation surveys will open 1 week prior to the course end date. Surveys close on the course end day for Summer Session courses and 1 week following the end of Winter Session courses. Instructors will receive email notification 4 days prior to the day their course survey opens. This email will give instructors a few days lead time before the survey opens to discuss the online process with teacher candidates either face-to-face in class or by email. It is strongly recommended that instructors arrange for in-class time to complete the survey; otherwise, completion rates are low. Instead, instructors are expected to allow time in the last class for students to complete the course evaluation. Instructors will have access to their evaluations and results several weeks after all grades for the term have been submitted. Learn more about the Course Evaluation website. Teacher candidates will receive an email on the day the survey opens. If they haven’t completed the evaluations 2 days after surveys open, they will receive a reminder. If they still haven’t completed the survey by the day the survey closes (last day of class), they will receive a final reminder. Teacher candidates have 1 week to complete the surveys for Summer Session courses and 2 weeks for Winter Session courses. Student completion of online evaluations is voluntary. Teacher candidates may appeal decisions relating to their academic coursework. Appeals should first be directed to the instructor. If there is no resolution, appeals should be made in writing to the Head of the Department concerned. If it is an EDUC course (including Practica or Community Field Experience), the appeal is directed to the TEO. 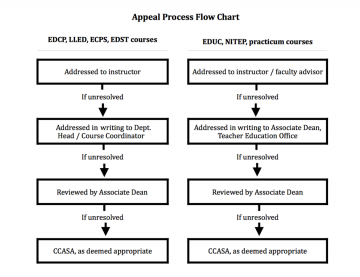 Appeals received by the Associate Dean within 60 days of the decision, will be reviewed and forwarded to the Committee on Curriculum, Admissions, Standings, and Appeals (CCASA). See UBC BEd Policies and Guidelines > Student Support > Process for Academic Appeals, or speak with a Program / Practicum Coordinator. Instructors are advised to keep accurate records of teacher candidate performance and attendance and to ask for a second reader/marker if grades are challenged. In the event of concerns related to practicum performance, practicum supervisors are advised to request a crosscheck observation and to complete an Interim Report. Copies of any documents to which the appellant refers. How to get your Library Card – Faculty who hold active appointments with UBC are eligible to a UBC Card at no cost. Please read How to Get a Library Card and meet with the administrative manager in your department for more information. Placing Course Materials on Short Term Loan – Required readings, course texts, course packages, videos and high use curriculum materials can be placed on reserve for short term loans (2 hours, 1 day, or 3 day). Visit the Course Reserves page for steps to reserve library materials. Contact the Education Library reserve unit at 604-822-0996 or email reserve@ubc.ca if you require assistance or more information. Requests received less than two weeks prior to the start of classes cannot be guaranteed to be processed in time. All requests are processed on a first- come, first-servedbasis. Learning About the Library and its Electronic Resources – Teacher candidates learn about the Education Library and its resources as part of specific courses. They participate in more than one library session; however, each of these sessions covers different content. You may check with traas@ubc.ca or call 604-822-0940. Instructor participation in this instruction is highly recommended. Note: New instructors should also contact the Education Library to arrange an individual orientation. Education Library – Save time searching for resources and find an information specialist on the library website. Instructors print class lists from the Faculty Service Centre (FSC). To print class lists with photos of teacher candidates, login to FSC > click on your class > click on Download/Print Class List > select all applicable fields (click image for photo to be printed) > click print or download. If instructors or cohorts wish to temporarily cancel days, (e.g., for additional school-based observations, etc. ), consent must be sought from the Director of TEO in advance. If instructors are to be absent, please email the TEO to post a note on the classroom door that day. Instructors may also email their students (cc the TEO) to inform them of a cancelled class. An instructor may not cancel another instructor’s class. EDUC instructors who wish to request a room change for the duration of their course should consult with the TEO Program Planning Manager. All other room changes are initially addressed with the Deputy Department Head or Course Coordinator. As a courtesy to other instructors, classrooms should be left tidy, especially following a change in classroom layout. Projects on display will be removed one week after the end of the respective semester. Instructors need to ensure that teacher candidates in a given course section are on the class list. Teacher candidates who are not on the list should be referred to the TEO. Changes to teacher candidates’ courses or movement from one section to another are only done in extenuating circumstances and require prior approval from the TEO. Before approving an overload for your class, please consult with the Department Head or Deputy Head, or a TEO Program Coordinator (for EDUC courses only). The Associate Dean of Teacher Education, in consultation with the Dean, will provide guidance to all instructors (regardless of department affiliation) if a strike or job action occurs. Every attempt will be made for timely and detailed correspondence to instructors, staff and teacher candidates via email. Please make sure your phone number and email address is up-to-date. If you need to make an update, email the TEO Administration Manager. All instructors are required to sign a Personal Safety Check List with the administrative manager of their department. Please refer to the “TEO Safety Card” or “UBC Safety Card” when contacting first responders. Campus security also keeps an up-to date list of emergency and safety contacts. Explain whether the injured is a teacher candidate, visitor, or staff. Always call 9-1-1 for students whether for First Aid or an Emergency. You will be asked for your exact location. If you are in the Neville Scarfe Education building, the address is 2125 Main Mall. Instructors should send someone to notify the Teacher Educator Office (TEO) Scarfe 103 when an emergency call is made. Another person should be sent to the front of the building to direct the ambulance to the injured party. If a teacher candidates injures him/herself or experiences a health issue in your classroom while you are instructing, please refer them immediately to a Teacher Education Office Program Coordinator (Bette Shippam or Lorrie Miller) for assistance. Call Campus Mobile First Aid 2-4444 from UBC phones or 604-822-4444 from a cellular phone. Minor First Aid treatment is also available in the TEO. Safety and security are a priority at UBC. See UBC’s Health, Safety and Environment Policies. Moreover, the University has put together a statement on respectful learning environments for students, faculty and staff members to provide the UBC community with the best possible conditions for learning, researching and working. In addition, UBC’s website, Emergency Procedures and Information, contains response protocols which are designed as guidelines to help you respond appropriately in case of situations which may compromise your personal safety. We also recommend reviewing UBC’s emergency procedures with your students. There have been a number of break-ins and thefts of personal belongings in the Neville Scarfe building over the years. Do not leave valuables unattended. Additionally, UBC Information Technology Services reminds UBC employees that there have been a number of computer thefts in the past year involving faculty and staff computers. Please remember to keep a backup of your data in a separate location from your computer. If you have important information, multiple backups on encrypted hard drives would be advised. For example, keep one in your office (not in or beside your computer) and one at home. Campus Security will engrave your valuables with your (or another related person’s) Driver’s License number and register your property in our database. Call them at 604-822-8274 or 604-822-5200 to arrange for engraving and registration. Call the RCMP at 9-1-1. After calling the RCMP, report the incident to Campus Security at 604-822-2222. Call the RCMP at 604-224-1322. If you are aware of any suspicious activity, call Campus Security at 604-822-2222. The Teacher Education Office located on the main floor of the Scarfe Building is the first place to refer teacher candidates who require support. However, should you be confronted with critical incidents, here is a list of resources to contact or refer the student to for assistance. If the destination is not on campus, and if the person does not have an emergency contact available to transport them to their destination, a taxi may be called. Specific location information needs to be provided to the dispatcher, as drivers often have challenges finding locations on campus. Faculty and staff who obtain taxis in such situations will be reimbursed for the cost by the Dean’s Office. Note: Students in crisis may be referred to a TEO Program Coordinator (Bette Shippam or Lorrie Miller) for emergency appointment referral (usually same day) to UBC Counselling Services. ETS supports the design, development, and deployment of innovative teaching practices in the Faculty of Education. ETS works with faculty members, sessional instructors, course developers, teaching assistants, graduate students, staff, and other members of the instructional community in order to support the design, development, and deployment of innovative teaching practices. They support and service three broad areas: curriculum and instructional design, professional development for faculty and staff, and learning technologies. Visit ets.educ.ubc.ca to learn about their services. The ETS Events Calendar has workshops available to instructors. Instructors (and teacher candidates) can obtain technology support from the UBC Learning Commons in the Irving K. Barber Learning Centre. The commons provides access to computers, technology support, printing, scanning, copying, and equipment loans. See all services. A series of Digital Sandbox Sessions are offered in Library Computing Commons – SCARFE 155. Sessions are open to all Faculty of Education faculty, staff, grad students and teacher candidates, and sessions are designed so participants can explore digital technologies on their own or through ‘drop in’ workshops and sessions. Dates and times of drop-in sessions are posted on the Digital Sandbox Session Calendar. The goal of digital sandbox sessions is to encourage participants to explore digital technologies in a playful way so that they can make decisions as an educator about how, when, where and if you would utilize particular technologies in your context – it always depends upon the instructor’s goals and learning objectives and how technology might enhance them. Faculty Service Centre (FSC) – entering grades and viewing class lists. FSC Request form – applying for access to Faculty Services Centre (FSC) to enter grades or view class lists. Teacher Education Office (TEO) – Information about the program as well as schedules, course syllabi, policies and guidelines, news, jobs, etc. Educational Technology Support (ETS) – technology support for instructors. UBC Course Schedule – List of all UBC courses, scheduled times, instructors, etc. Standard Timetables for Elementary, Middle School and Secondary teacher candidates. The Management System Portal is where you keep UBC updated with your contact information, and to view current pay statements, compensation history, direct deposit banking information, benefit information, pension information, and emergency contacts. Use your CWL to connect your laptop and mobile devices to the campus wireless service or to use a computer station on campus. Access UBC email from any computer connected to the internet via FASmail. Access the Faculty Service Centre (FSC) to access class lists, enter grades and send emails to students. Please visit the FSC information page to request instructor access. All students submit evaluations of completed courses on CourseEval. The Faculty of Education provides you with a UBC email account while you are working at UBC. Having a UBC email account gives credibility to all your correspondence with students, faculty, schools and other institutions especially when students request references once they have graduated. The TEO Administration Manager and UBC IT will guide you through the process of setting up a new email, as it takes a series of steps. If you have any questions regarding your UBC email account, please contact Joel Kobylka or call 604-822-3888. In accordance with the Email Privacy Memo issued by the University Counsel in September 2010, University business should not be conducted on email systems outside of Canada (e.g., Hotmail, Gmail, etc.). A Virtual Private Network (VPN) is required for access to some essential secured websites (e.g., The Management Systems Portal) at home or on your laptop. The VPN is a connection which uses encryption to protect data and prevent others from accessing data transferred between your computer and the campus network. UBC Information Technology offers free VPN services to UBC students, faculty, and staff. Once you have your CWL account, you can configure your computer for myVPN service. This process requires 20 minutes. If steps are skipped or interrupted, the download will be compromised. For VPN support, please contact the UBC IT Help Desk or call 604-822-2008. The UBC Card is your UBC ID and library card. To obtain your UBC Card, go to the Carding office located in the UBC Bookstore. UBC Cards are valid for up to five years or for the individual’s term of employment. Bring your UBC employee number, UBC appointment letter, and one piece of government-issued photo identification. All faculty, staff and students are required to pay for their parking at UBC. West Parkade (entrance on Lower Mall) is the closest parkade from the Neville Scarfe Building. The daily rate is $16.00. Please note that parking lots tend to be full before 9 am when classes are in session. To learn more about permits and rate, visit the UBC Parking website or call 604-822-6786. Parking fees while doing business at the university or TEO office will not be reimbursed. Warning: Your vehicle will be towed if you park in the reserved and restricted areas behind the Neville Scarfe Building. Keys to hallways and offices are authorized by the TEO Administrative Manager. Once it is determined which keys you require, the Administrative Manager sends a request to UBC Key Access Information System. You will be notified via email when your key is ready for pick up. Deposit information and the location of the pick-up will be provided by UBC Key Access Information System. Hours are Monday – Friday 8:30 am – 4:30 pm. Note: When picking up keys, you must show photo ID and you may be asked to pay a refundable deposit for your key(s). Keys for your cubicle in Room 1310 are provided by the TEO Administrative Manager or one of the Administrative Clerks. You are not required to place a damage deposit. If the key is lost you will be required to pay $75.00 to replace the lock. Faculty Advisors for the Teacher Education Office are housed in Room 1310 of the Neville Scarfe Building. Each TEO hire is provided with a work station and a lockable drawer for their personal items. If supplies are missing from this room, please contact Gladys Ling. Posted mail will be delivered to your assigned mail tray in room 1310. Printing – TEO instructors who have access to Room 1310 can send print jobs to the photocopier in that room from their laptop and mobile devices if they are connected to the Internet via “ubcsecure”. Please contact UBC IT Desktop Services for help setting this up. Photocopying – The TEO gives each instructor a personal code for the Photocopier/Printer/Scanner in 1310. Please limit photocopying to important documents. Faxing – Instructors can access and use the Teacher Education Office’s fax machine (604-822-8227). Please ask for assistance at the TEO reception desk. Rooms can be booked for all ad hoc, classroom and conference rooms in the Neville Scarfe Building. All one-time classroom bookings can be requested by email at schedulingservices@student.ubc.ca. For academic course room booking questions, please email Jennifer Stewart. To book small meeting rooms located throughout the Neville Scarfe Building, please send your requests to the TEO receptionist. Parking petty cash (for a couple of hours) and parking passes (for more than 4 hours) are available from the TEO Administrative Manager for guest speakers/lecturers in the following EDUC courses: 450 (Inquiry I), 451 (Inquiry II), 452 (Inquiry III) and 440 (Aboriginal Education in Canada). Please provide us with the name of the guest and the date of the class prior to their visit. You will need to sign the petty cash/parking passes out and ensure your guest signs the receipt. Once your guest has signed the receipt, please return it to the TEO within 3 days. Faculty Advisors often wish to provide a token of appreciation to guest speakers. For the following EDUC courses: 450 (Inquiry I), 451 (Inquiry II), 452 (Inquiry III) and 440 (Aboriginal Education in Canada), we have an assortment of gifts already purchased, wrapped, and with a TEO Thank-You card. Please see the TEO Administrative Manager for more details. The TEO creates a file for each Teacher Candidate admitted to the Teacher Education Program. This file is housed in the TEO file room and contains all admission processing and program advising notes. The information contained in the files is collected only for those purposes. Teacher candidates’ files are not available to Faculty Advisors. Please contact your respective Practicum Coordinator if you wish additional information. Please be advised that access to the file room is restricted to TEO staff only. BEd instructors and faculty advisors will meet with the Practicum Coordinators where practicum supervision mileage and other expense claims will be discussed in detail. Mileage claims are done through the online payment tool (OPT) after each practicum is completed. Training will be provided at the FA meeting in October with more detailed instructions. If you have any questions please contact Gladys Ling or Joel Kobylka. Trips to UBC for meetings, classes and parking at UBC will not be reimbursed. Employment opportunities for teacher candidates, instructors, and faculty are post on the TEO website, under Careers Opportunities in Education. You are welcome to submit paid or volunteer opportunities. Teacher Education events are listed on the TEO website, under Events Calendar. As instructors prepare course outlines for the coming academic year, it is essential that care be taken in preparing readings for students. We have prepared several ways you can undertake this activity given the policy changes at UBC over the last few years. UBC requires each of its faculty, staff and students to comply with copyright law. This applies to photocopying as well as sending PDFs of published material. There have been some recent developments regarding the license agreement with Access Copyright, but UBC is maintaining its existing license agreements with a large number of publishers, including an increasing number that provide access to online resources. If you use a lot of articles and on-line publications/resources, you can embed their Permalink or Digital Object Indicator (DOI), found in the item’s permanent record on the UBCLib site, into a Permanent URL (PURL). This makes it easy for students to access the item once they have logged on with their Campus Wide Login (on or off-campus). Instructors can create custom course packs through the UBC Bookstore. Small orders (e.g., for one cohort) are acceptable, and you may request a paper or electronic version. Email or call 604.822.0874 to get an estimate and/or learn more on how to create/order custom course materials.